Matt King OBE is a leading motivational speaker, lawyer and author. Like you, Matt has experienced adversity. Personal problems, professional challenges, who hasn’t? But unlike others, Matt’s challenges were brought about via a broken neck, paralysis and a strong view at what is achievable in life. Following a rugby accident at the age of 17, Matt was paralysed from the neck down. 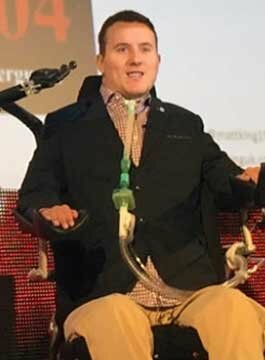 Ventilator dependent and laying in a specialist spinal cord injury unit, his life, goals and ambitions had changed dramatically. His first goal was to survive. Matt’s view is radically different from others professing the secrets to success, because he’s been there and done it, and the techniques and strategies he shares work! How will you know this? Well, Matt has gone from a paralysed teenager, through to becoming a pioneer pushing the boundaries of what can be achieved in life, irrespective of one’s situation. First-class law degree, legal career, mouth painting artist, skier, completing global marathons and author – Matt is the real deal! Sharing the same skills and techniques he has used to excel, those hearing the emotive and provocative way Matt shares his journey will gain an all-important perspective of the challenges they face. Delegates leave Matt’s presentations armed with the practical tools to maximise their potential in both their personal and professional lives. Matt reveals the core beliefs and proven strategies that led to his personal and professional success. Proving setbacks can be turned into opportunities, Matt explains how we must be accountable for making changes and the personal resilience required to accept and overcome is a state of mind attainable by every one of us. As a result, Matt takes you on a rollercoaster of emotions, leaving you inspired and empowered to be the best YOU can be. Matt uses his experiences to help anybody, of any age, overcome the obstacles in their path. Matt King was awarded an OBE in 2012 for services to charity and those with disabilities. He was the youngest person ever to receive the honour. With a foreword by Sir Alex Ferguson, Matt’s autobiography, ‘04.04.04‘, ensures his legacy is a lasting one. Furthermore, Matt is also a solicitor for Williams F1 and mentors spinal-cord injured individuals.